In the first issue of the magazine, Destry Wion proposed a new family emblem that generated a lot of pushback, including from me. While it’s understood that Destry’s proposed emblem was simply meant as a fun mark to identify Textpattern’s own websites (not meant to be a change to the brand itself), the majority of people nevertheless felt it would still be confusing. Yet there is a problem with Textpattern’s branding. Not only might a family site emblem be a good idea (albeit more brand-compliant), but an evolution of the brand itself is needed—a well-thought refinement that improves brand clarity and retention. As creator of the existing Textpattern logo, and a new member of the editorial team, I outline a slightly new look and function for the Textpattern brand and invite you to discuss the new direction. Together we can help re-establish the level of respect the Textpattern brand name once had. Textpattern is changing. The project now publishes a magazine, with an editorial team that handles more than just writing articles. Textpattern CMS version 4.5 is soon to release, including the first new default theme since Textpattern’s creation. Textpattern Plugins (formerly Textpattern Resources) will be back on track soon to become a central interface for plugin search/retrieval, as well provide sophisticated interactivity for plugin developers as they maintain plugins over time. Regular theme competitions are being planned (more insights on that in this issue’s from the editor). And the first bricks have been laid for Textpattern 5. With all this activity happening at once, now is the right time to revisit the Textpattern brand with a look to the future. Textpattern has been my favorite software since I began building CMS-based websites, so I’ve been putting my mind to figuring out what it would take to make the brand future-proof. It’s clear that some people like the aesthetic effect of using all-caps, but there’s a strong case to be made about it not communicating the brand name effectively. People who don’t know Textpattern might [correctly] guess the all-caps isn’t the real brand spelling, but that’s where the intuitiveness ends. From there, most people seem to [think it’s written as] “TextPattern”, and we see this in the wild all the time, where reviews are done about Textpattern and they spell it in camel-case. That’s because the logotype is not conveying the brand name as clear as it could be. 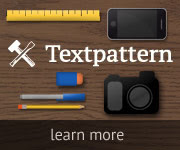 When those authors do their article research, they go to textpattern.com and see use of “TEXTPATTERN” in the logo and splattered all over the home page copy. It’s confusing them and they don’t even realize it, which is why they confidently write “TextPattern” in their reviews. Other people read those reviews, it gets in their head (“Oh, hey…it’s TextPattern, like WordPress, and ExressionEngine, and [ProcessWire], and…”), and the problem perpetuates… If the [brand] design is cool, but not effectively communicating, it fails. The latest of far too many reviews getting the logotype wrong is 10 Most Popular Content Management Systems Online at MakeUseOf.com, where, once again, Textpattern’s name has been “camel-cased”. It’s only one point but it stands for several brand inconsistencies the Textpattern project suffers from. Beginning with the logo itself, we want to make the brand stronger by clearly showing the brand name as it should be recognised and used. Such a logotype, along with removing the many instances of all-caps in the web copy of the textpattern.com website, leaves absolutely no confusion as to how the brand name is written. Any use of camel-case after that in a CMS review is just lazy journalism. 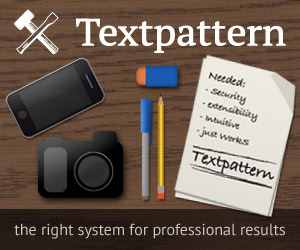 Textpattern’s logo consists of two important elements. One is going to stay the same, and one is going to change. Despite giving the impression of “The People’s Democratic Republic of Textpattern” (thank you, Mr. Reisenberger), I must confess that I’m very attached to the hammer and chisel mark. It’s something to identify with and it reminds me of where the symbolism comes from—the stonemason logo by Dean Allen. Not every CMS has such a mark, so it makes Textpattern stand out a little. The existing logo mark is not going to change. When I first redesigned the Textpattern logotype in October 2009, I used an all-caps font by the wonderful Dutch Type Library. Back then Typekit had just been founded and WOFF only reminded me of a barking dog. Things have changed. Today a brand online has a greater range of typeface options, and are usable anywhere HTML is used, not just restricted to logos and column headers via static images or old Flash tricks. With so much momentum in the project these days, it’s time to think more seriously about a typeface for Textpattern. This time the logotype is about expressing the brand name more clearly with a font having greater practical use. And the new Textpattern font has to be free since anything else wouldn’t fit the open source nature of the project. PT Serif Regular and Bold font weights compared. As logotype, one is too light and the other to heavy. After insightful research, I came back to what was my favorite from the start (lucky me), the PT family by ParaType, featuring a serif and a sans-serif that are well-hinted and provide a whole lot of non-European characters. And PT Sans and PT Serif are available via Typekit and Google Web Fonts, so embedding them shouldn’t be too difficult. What I like about PT Serif is how it conveys the essence of Textpattern’s text-based approach to web content and design, as well as how it reflects the humanistic touch of the Textpattern community. But choosing PT Serif as the brand typeface was just half the battle. Even though the serif’s regular and bold weights work beautifully in normal HTML copy, the weights of each one as logotype don’t look right to me. The bold version is too strong and the regular would be blown away by the next breeze. Blending the two brought the right weight for the new logo. The new Textpattern logo, with a smart logotype that's perfectly weighted—glorious! There will be vertically-oriented versions of the logo too. The new Textpattern logo in vertical orientation. In order to enhance the impact of the logos, I added a safe area around each one where no other graphic elements should be placed. This safe zone will come integrated in all the revised logo files—soon available at textpattern.com. New logo showing safe zone for ensuring proper use of spacing. New logos for Textpattern's family of sites; a unified concept for to help with brand strategy. Another long-standing problem is the inconsistent manner in which the Textpattern brand is used in the family of sites, and other non-project sites as well. Impacts range from brand recognition to confusion about website ownership to general site usability. New visitors to these sites are no doubt unsure about what is a Textpattern project site and what isn’t, and thus what information to wholly trust. A good step to improving the situation is adopting a more unified identity across the resource locations. Realigning the family of resource sites under a consistent masthead and navigation, while keeping structure and layout true to each site’s specific content types, will work favoribly in two ways. First, it should help new users and visitors find project-sourced information easier (brand recognition, consistent navigation, etc.). Second, a unified look and feel will reflect more professionally, and thus help make a stronger impression on the world. I love what Stuart Butcher did to the Textgarden logo, but seeing the project’s sites reflecting a well-thought and unified whole would be a welcome change for the times, and likely a critical one for the future. Some of you will no doubt comment on the fact the magazine is missing here. That’s not because we didn’t consider it; on the contrary, we discussed it to great length. In the beginning, I even took the devil’s advocate position and argued for making the logo fit into the family mold above. But as the discussion progressed and the range of factors were considered, the case for setting the magazine apart from the herd made more sense. In fact, I now believe that putting a logo (like the ones above) on the magazine would be a bad decision. I won’t go into the reasons why because Destry already covers the general logic in his address from the editor this issue. However, that doesn’t mean the Arial font used in the magazine’s logo for the duration of issue 1 wasn’t making me crazy, so I produced a new take on the “TXP” and the team was happy to accept it. The new TXP logo has more character and is more harmonious with the rest of the site’s typographic choices. It will be implemented as an SVG file so it should do well across the range of device widths. If it’s not in place as you read this now, it should be anytime. Positive version of new Textpattern family emblem for use in footer of family sites. Coming back to where this all started, we on the editorial team took Destry’s original emblem idea and hashed-out a more brand-safe version that could actually work well. The emblem comes in positive and negative versions. The one shown here works well on light backgrounds, and you can see the other version for dark backgrounds in the magazine’s footer now (or soon will be). That should make a few people happy. This emblem is more to my liking, and closer to the project’s identity. It may be used in the footer or elsewhere to show a site’s official status, though the footer is probably the best location. Nobody knows better than me how changes to a logo design can generate passionate responses from people, and often with polar points of view. I have no doubt it will be the case here, though hopefully less polar since the ideas come from better consideration this time of how to improve the brand. In addition to your immediate thoughts, what would really help us roadmap is commentary on the following topics. Brand changes mean nothing if there’s no strategy behind it, and no tactical action to see it through. After being with the editorial team for the last three months, I’m confident the strategy part is being considered, and the action plan partly so. Brand implementation is what needs to be mapped, in a unified way across the family. Related to branding, though a lot less graphic, are the various key URLs for the project, and the navigation that’s used around them. Needless to say, textpattern.com, textpattern.org, and textpattern.net, is a little bewildering if all a person is trying to do is find Textpattern CMS. Anyone looking at these URLs can easily tell which site is at the top, and what resource each site provides via key terms the whole world understands. It’s not hard to imagine these five domains fitting easily into a main navigation and used consistently through the vine. how to do so correctly. There are documents in progress already for editorial needs, including the Textpattern editorial style guide and the magazine’s presentational style guide (both subject to relocation once they’re closer to being finished), so it only makes sense to complete the portfolio with visual brand guides too. a “Textpattern Partners” badge for sites like TXP Tips, txp-fr.net, etc. a smaller “Published with Textpattern” badge for anyone else simply running a Textpattern-powered site. The different badge types would provide a certain amount of distinction between family, affiliate, and “published with” websites. One nice thing about providing these from an official source is that people are more inclined to use them since they’re already available and nice; there’s no need to half-bake something of their own. We would provide the graphic, the code snippet, the proper link back and alt="" value, etc. … all packaged up and ready for a quick copy/paste to wherever someone wanted to add it. Lastly, maybe we take brand elements all the way to the CMS too, in this case using the PT family in Textpattern’s default front- and backend interfaces. A lot there to think about. I look forward to your thoughts.